As part of the “Gram SwarajAbhiyaan”, the “Swachh Bharat Parva” was organized all over the country yesterday. 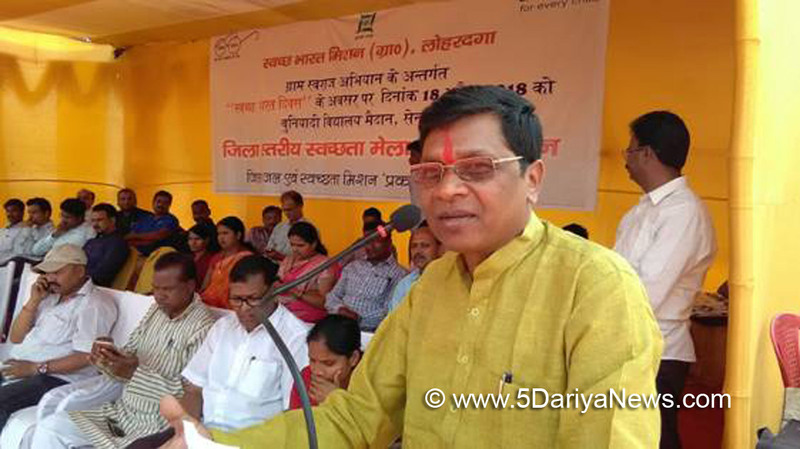 The Minister of State for Tribal Affairs, Shri SudarshanBhagat participated in Swachh Bharat Parva celebrationsat Lohardaga in Jharkhand.SudarshanBhagatgreatly appreciated the vision of the Prime Minister, Shri Narendra Modi and added that it is due to the efforts of the Prime Minister that today, Swachh Bharat Abhiyaan has taken the shape of a public movement.He further empahsised on the importance being given to the Mission by the Government. Through several initiatives like SwachhtaPakhwada, Swachhta Action Plan etc., the Government is trying to link people from all over the country and all walks of life into this Movement, the Minister said.Beginning on 2nd October, 2014, the Swachhta Campaign has been implemented by the Central Government all over the country with the help of States, NGOs, PSUs, Corporate Houses among others due to which 1.95 lakhs villages and 137 districts in the country have now become open defecation free, Shri SudarshanBhagat explained. The SwachhtaParv celebrations were organized by the representatives of Panchayats and local rural people at Lohardaga.